I’ve had the opportunity to look into the possibilities for organizations to use Office 365 Video. Using videos within an organization can be a great way to connect to your employees. This could be a welcome video from the new CEO, a safety regulation video or training material to help new employees get on their way. The Video portal homepage consists of a few key sections. The Spotlight area gives you the possibility to show videos, which have a strong presence on the homepage. The Popular videos section shows videos that are popular within your organization. The last section is the Spotlight channels. Here you can select 3 channels, from which you show the spotlight videos on your homepage. The popular videos in particular is a great way to see which videos are popular in your organization. The only downside is that an administrator cannot remove or influence the popular video section. For each video on the homepage you can see the total views and the length of the video. Personally, I would like to have a little more control over the Office 365 Video homepage. For instance, a channel overview on the left or right side of the screen would be useful to navigate between channels. The possibility to view a video from the homepage could be easier as well, as now you have to click the context action menu (the 3 dots). A pop-up will be shown, starting the video. Besides showing videos on your homepage, an administrator has the possibility to create channels. Permissions can be set per channel to allow only certain people (or groups) to view the videos in the channel. When an administrator creates a channel, a SharePoint Online site collection is created in the background. This is where the video and all metadata will be saved. A copy will be sent to Azure Media services. Microsoft posted this nice video on YouTube explaining how this works behind the scene. The channel creation process could be more smoothly, as the administrator is required to wait for the site collection to be created, which takes some time. When you close the window while a channel is creating, the channel will still be created, but the channel color you selected won’t be saved. It would be nice if the creation could happen behind the screens, so the administrator doesn’t have to wait for the site collection to be provisioned. While watching a video, Office 365 Video provides you with several options. You can share the video, see the description of the video, or even comment on the video by using the inline Yammer conversation on the right side of the screen. Below the video is a list of videos that you may also like. Videos will be processed and displayed in Delve as well. 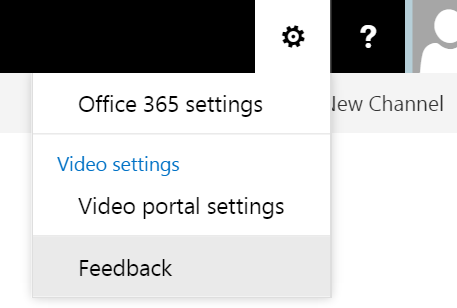 This is a really neat feature that helps employees engage with Office 365 Video without actually navigating to Office 365 Video in the first place, as relevant videos are being showed in Delve. 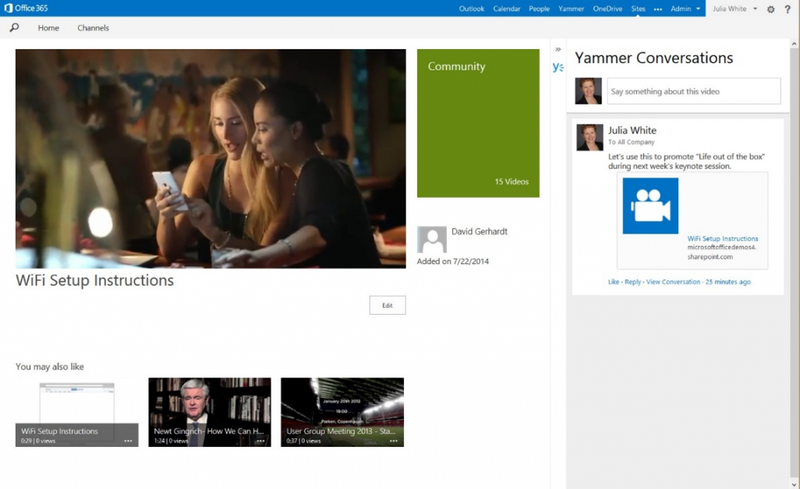 In conclusion: Office 365 Video is a great initiative that has a lot of potential. At the moment of this writing, I think the service could still be improved by integrating Office 365 Video with other Office 365 services even more. In particular, some of the features that SharePoint online has, could help make Office 365 Video even better. As Office 365 Video is still a relatively new service, I expect Microsoft will make regular improvements that will add business value organizations. If you are currently testing or using Office 365 Video, make sure to provide feedback to help improve the service. On the top right corner of each page you will find the option to send Feedback to Microsoft.